Orville Meyer, probably most famous for developing the bullet catch for Ted Annemann, demonstrates here his skill to routine amazing effects. The stunt of forming a sixteen cell magic square that will add up to a number suggested by a spectator is a spectacular mathematical feat. Memorizing and repeating a list of objects named by members of the audience is an interesting and impressive mental demonstration. When you combine the formation of the sixteen cell magic square with the memorized list of objects, you really have something! But we do not stop there! In this version, the double-barreled feat may be done blindfolded! The spectators realize that the performer must be keeping everything tabulated in his mind -- an amazing and incredible demonstration indeed! And this is exactly what is done, as no secret gimmicks are required. This feat has, for many years, been featured by several of the nation's top-flight professional mentalists. The system was ten years in development. It is a really great stunt as it can be done anywhere at any time in almost any circumstances. It's applications are much broader than your typical magic effect. It plays particularly well with the college and university groups or any other sophisticated audience. 1st edition 1961; 21 pages. 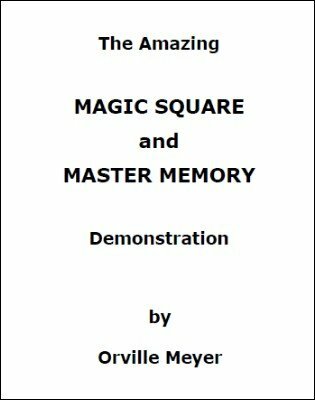 If you like magic squares you should also check out The Ultimate Magic Square .